YANGON—Inwa, formerly known as Ava, was once the royal capital of the mighty Burmese kingdom. The city was founded by King Thado Min Phaya in 1364 at the confluence of the Myint Nge and Ayeyarwaddy rivers. Since the earthquake of 1838 destroyed the city, it has become a place of hidden secrets and many features of the ancient capital remain in various states of dilapidation resulting in a mysterious collection of historic pagodas, temples, stupas and other buildings. Nowadays, a visit to Inwa can bring you back to the rich historical past through palace ruins, a massive damaged wall and moat. 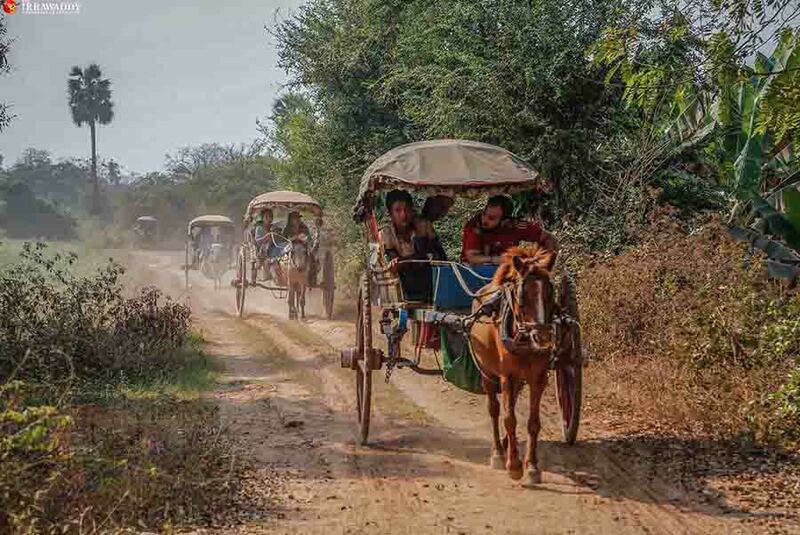 The farms, village and horse carts that continue to exist there today will give a strong sense of Burmese village life that feels a world away from cities like Yangon or Mandalay. For these reasons, I did a day trip to Inwa while visiting Mandalay a few weeks ago. 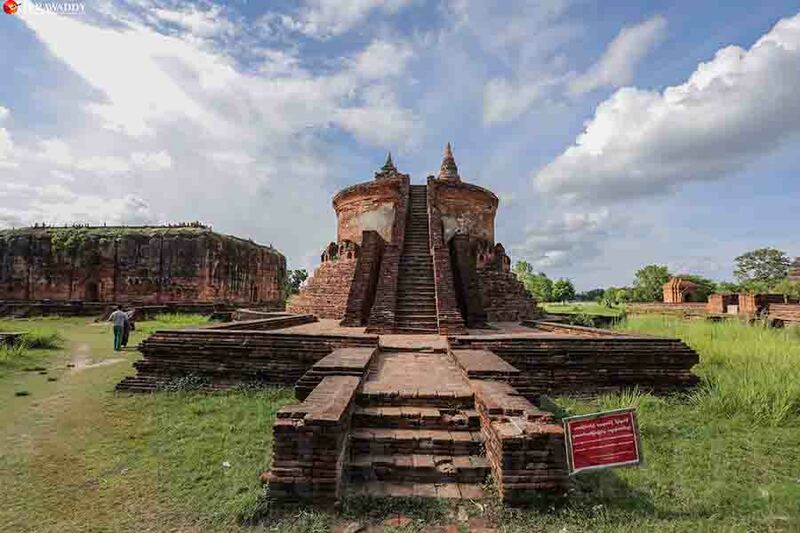 The distance from Mandalay to Inwa—only 21 kilometers south of the city—makes it easy to visit. We rented a car for the day for 35,000 kyats and it only took about 45 minutes to get there from Mandalay. 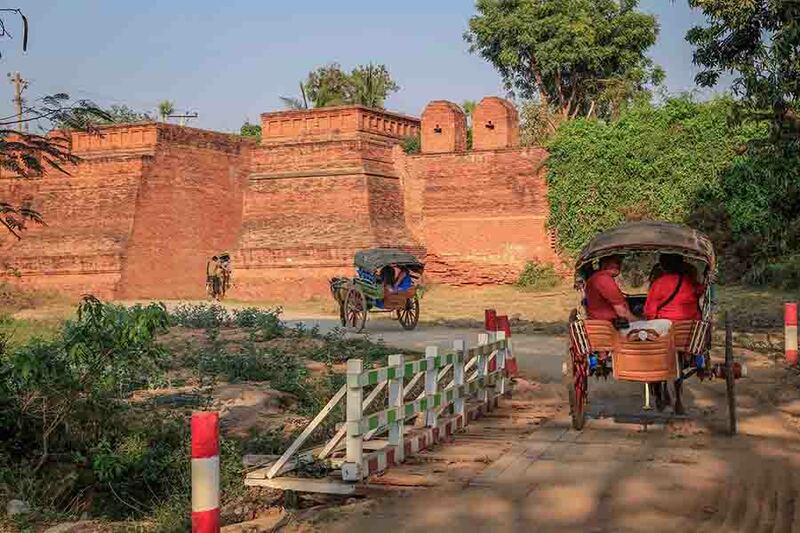 Starting from the city’s entrance, the roads were clear and lined with a small brick wall next to another massive palace wall, and a moat which all gave me a sense of being in an ancient Burmese village and I was so excited to see more. Many horse carts were being driven around by the local women and some of them were explaining the city’s history as paid guides. Our first stop was at the Mahar Aung Mye Bonzan Monastery which is also known as Me Nu Oak Kyaung. The monastery is located at the entrance of Inwa Palace and it is one of the few remaining historic buildings from the Inwa dynasty. It’s famous for its brick building which was donated by Queen Nanmadaw Me Nu. 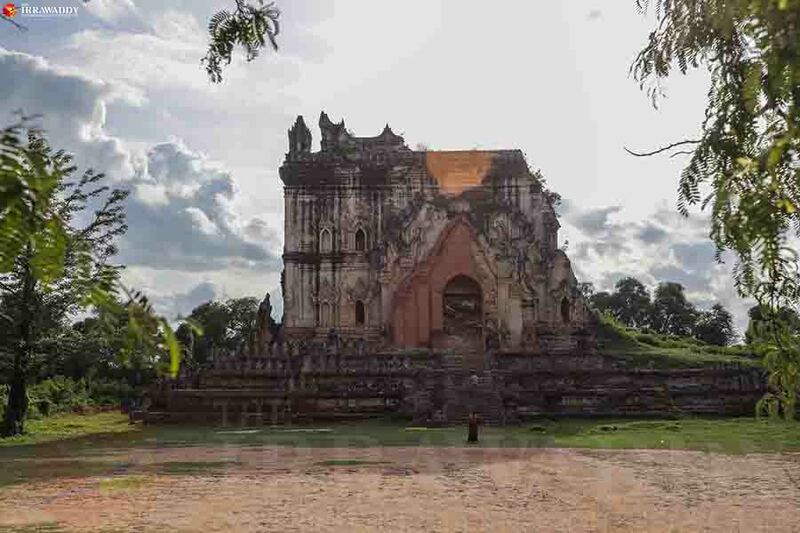 The monastery was built in 1822 and badly damaged in the 1838 earthquake but later restored by Queen Sinphyu Mashin, a daughter of Queen Me Nu and a queen of King Mindon, in 1873. 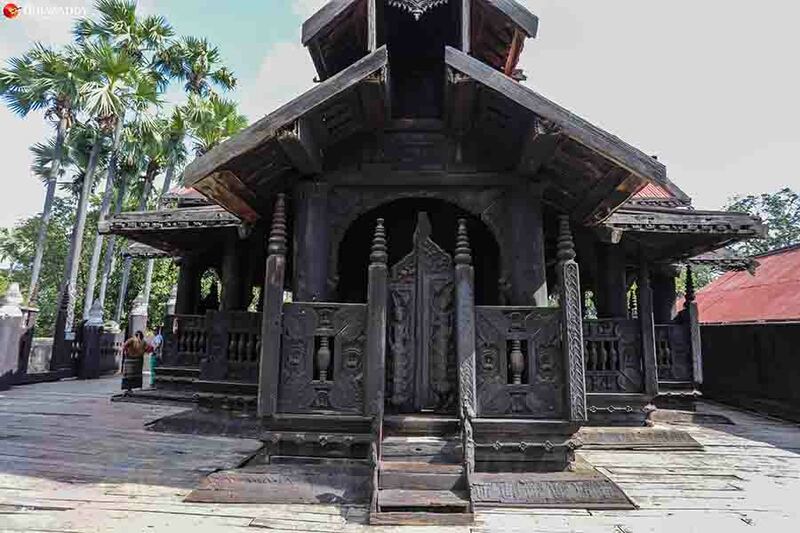 Most old Burmese monasteries were built of teak or wood but this one was built of brick with the floors and interior walls made of teak. The monastery is a yellowish color and is really impressive from the outside. Inside the monastery, you can see mural paintings from the Inwa dynasty and there are also Buddha statues. The landscape scene the monastery is set in is really beautiful and it is a good opportunity to take a photo. Then we moved to the next place, a teak building called Bargaya Monastery first built in 1595. During the reign of King Bagidaw (1819-1837), the monastery was burnt during a huge fire outbreak. Many parts of the monastery were damaged and abandoned. The Myanmar Government resurrected the monastery based on designs of the old one in 1992. Now you can see the amazing architecture of the building and the brilliant teak craft skills used. The whole black monastery wall is decorated with engravings mostly of birds, flowers, and people. Inside the monastery, there are high wooden pillars and it’s really mind-blowing. There are a few Buddha statues which were sculpted during the Inwa dynasty. Many parts of the building such as the floor and tiered roof are damaged and need restoration. The monastery is still in use by monks with some living there, but you can still go inside. Bargaya Monastery has an entrance fee for foreigners of 10,000 kyats. In Myanmar, visitors have to take off their shoes at those kinds of religious monasteries, temples and pagodas but I saw some foreigners there wearing shoes inside. I thought maybe they didn’t know or they forgot. I would like to request that foreigners follow these rules when they visit there. We then traveled down a narrow earthen road flanked by fields of banana trees. After 10 minutes’ drive we saw some beautiful shrines. One shrine was called Wingabar and though the building was damaged on the outside, we could still enter it. The inside of the building is like a maze and you might get lost along the way so please ask the vendors nearby and they will show you the right way to go upstairs and get to the top of the building. The stairway was really narrow and dark so we had to use phone flashlights but the view from the top of the building was green and beautiful. At the top of the building, there were a lot of human-made brick stacks and I built my own one too. Near this shrine is another called Myint Moh Taung and you can also climb up to the top of the building of that one. The place really reminded me of some pagodas in Bagan. 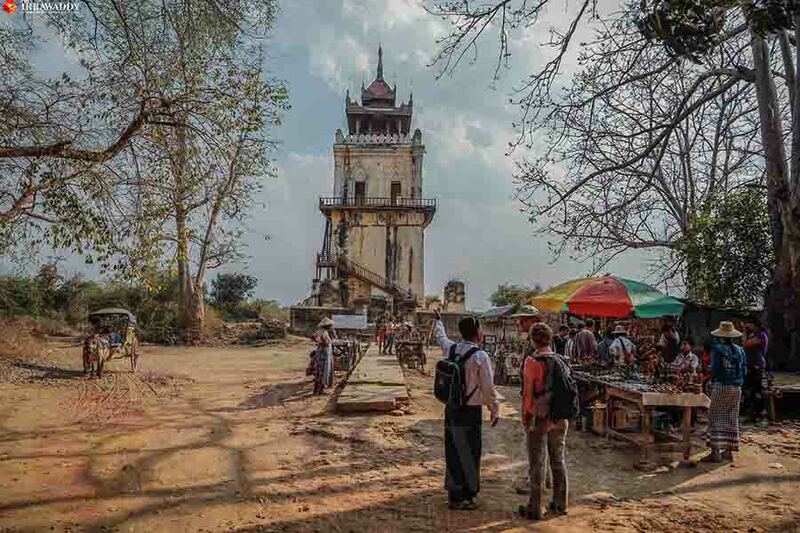 Another example of the old Myanmar architectural style is a watch tower called Nan Myint which is 90 feet (30 meters) high and was built in 1822 but it was also destroyed by the earthquake of 1838 and now leans perilously to one side. Visitors can only view it from the outside because the wooden stairs are damaged and can’t be climbed. I thought the trip had ended as we were leaving the ancient city through the palace entrance, but then we observed some other temples like Yadanar Hsimee and Lay Htet Gyi pagodas which are located on the boundary roads of Inwa Palace. Yadanar Hsimee Pagoda is already an Instagram-friendly ancient attraction of Inwa and there are some souvenirs to buy there. 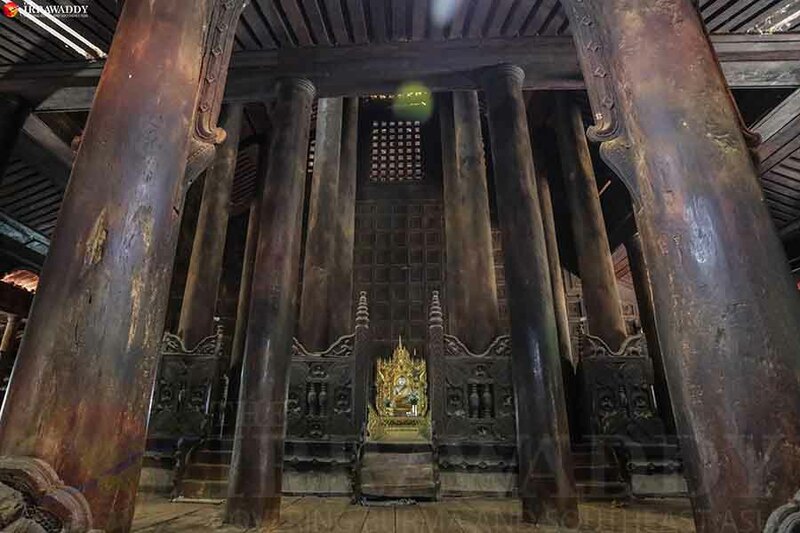 Though the pagodas don’t have much background information and most people don’t know their exact history, they are famous for their building structure, ancient engravings and mural paintings. Then the trip really was over. On reflection, I have a few travel tips for a visit here. Inwa is really hot so wear comfortable clothes and bring sunglasses and a hat as well. I strongly recommend wearing slip-on shoes because there are a lot of pagodas, temples and monasteries and you will have to take off your shoes repeatedly. Follow these tips and I am sure you will enjoy your day at Myanmar’s ancient royal capital.